Easy, fresh and healthy, just the way we like our meals around here! Line large baking sheet with parchment or foil. Combine all marinade ingredients in small dish. Reserve 2 tablespoons of marinade to brush on fish. Toss chopped veggies in remaining marinade. Brush fish fillets with reserved marinade. 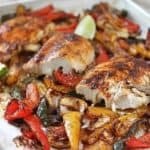 Nestle fish fillets on top of veggies. Bake for additional 20 minutes or until fish is firm to the touch. Serve with all your favorite fajita condiments!